Neurology—the study of anything related to the nervous system. As scientific and extensive as it may sound, taking up Introduction to Neuroethics by Professor Kim Dong Joo (Department of Brain and Cognitive Engineering) will make one realize that the study extends to multiple areas of human life. The Granite Tower (GT) chose Introduction to Neuroethics as a class that should be recommended to students of Korea University (KU) for this month’s KU Lecture series. 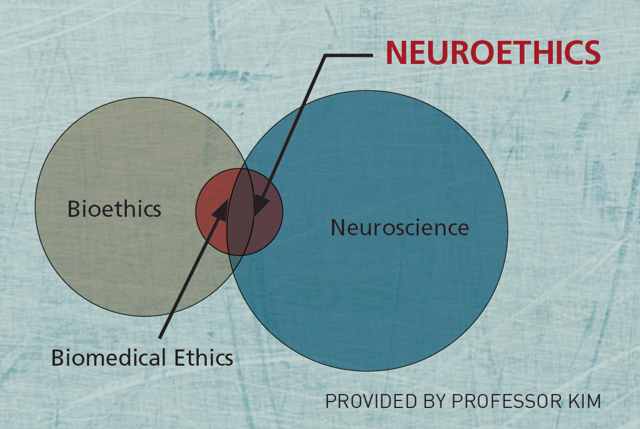 Neuroethics, by formal definition is “a part of bioethics, which considers the intended and unintended consequences of neuroscience in medical practice, research, and society at large.” During Introduction to Neuroethics, students will learn multiple fields that neurology can be applied to. These include battle zones, where experts are currently debating whether the usage of mentally invasive techniques is ethical; or even the criminal justice system, where mental illnesses can be considered as loopholes of justice. Students will be given the opportunity to reflect upon these issues and share their insights with their classmates through this course. The class is conducted in English, which attracts numerous foreign students from diverse backgrounds. As different backgrounds shape the way individuals think, students will be exposed to a vast array of perspectives in class. What can be considered an ethical issue in a certain demographic may not be in others. For instance, China, where national security trumps individual privacy, would more likely to use neuro-invasive measures against individuals. This would receive a great deal of backlash if it were to happen in the United States (U.S.). While there could be disagreements during discussions, there is an aura of respect for all kinds of ideas. As the course progresses, it deals with a considerable amount of issues within neurology that involve ethics. Students will be faced with various issues such as, “Who should make decisions regarding a mentally ill patient?” or “Are mentally invasive technologies justified during a war?” Students themselves can raise and answer questions and are expected to present pressing issues of neuroethics for their final presentation. The general environment of the class is well facilitated by the professor who encourages active participation, thus resulting in a fruitful discussion every class. GT: What motivated you to take this class? I initially had an interest in psychology and brain physiology. Its concepts are interesting to the point that I thought it was worth dedicating a semester for. Ethics was something I have not considered seriously, and that was another point that had me reeled in. Thus, I decided to take Introduction to Neuroethics, and I have absolutely no regrets. GT: What were your initial expectations for this lecture and were your expectations met? I had no expectation walking into the class. I simply went in there and hoped for the best. The class was very interesting and entertaining. I learned that ethics is an issue that is challenging and can have multiple perspectives. If you have taken Advanced Placement (AP) Psychology during high school, however, most of the material that you will learn up until midterms will be familiar. GT: What was your favorite aspect of the lecture? I would say it is the active participation aspect, as well as the high number of foreign students. It did take me a long time to get used to participating, but I soon realized how cathartic it is to express your opinions during a discussion. The diverse composition of the class helped foster the environment where everyone was free to share their perspectives. GT: What prompted you to teach this lecture, and what are the main points that you wish for students to learn? My research area since graduate school has been clinical neuroscience and, in particular, the cerebrospinal fluid (CSF) dynamics and related disorders. Many CSF-related diseases exhibit similar symptoms to dementia and Alzheimer’s disease, which significantly damage the cognitive ability and perception of affected patients. By spending much time with patients and engaging in research, I became aware of the ethical problems the patients, their families, and even the government face. However, while there are many students who are interested in neurology, only a handful of them realize that neurology deals with various ethical issues. Thus, through Introduction to Neuroethics, I wanted to teach and nurture students’ interest and understanding about neurology and its societal implications, and to think about them in depth. GT: What are the top criteria you consider when grading students? I consider students’ novelty of ideas as the most important virtue of the class. To possess novelty is to have original and unconventional thoughts. This reflects students’ ability to exhibit empathy and logical understanding of the various issues brought up in class. I refer to essay questions in the midterm, presentations, and participation. GT: Do you have any last words for your students? KU students are superb problem solvers. This is natural and expected given that these students were some of the top applicants admitted to this prestigious university. However, students must realize that problem searching ability, in reality, is what counts. This not only gives one various opportunities in life, but also makes life more purpose-oriented. Through this lecture, I hope students will acquire such ability by further developing the sense of empathy, which I try to do by exposing them to a plethora of ethical problems.